Pre-cooked hams can be a huge time-saver when it comes to hosting family dinners or large get-togethers, but oftentimes they’re missing that special touch. 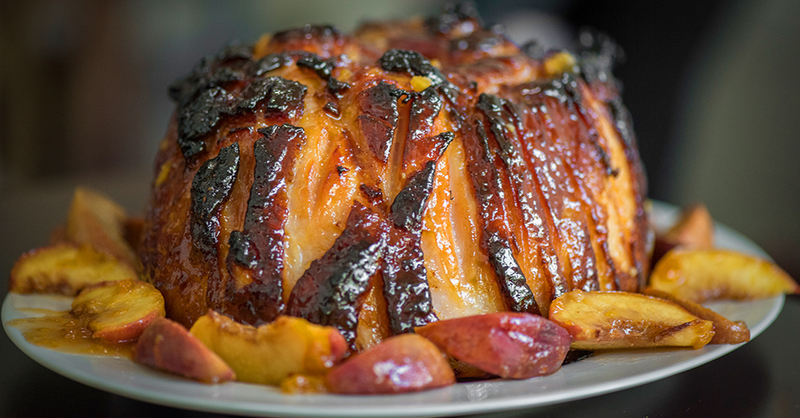 Lucky for you, we’ve got just the thing… a fresh and fruity glaze that turns regular ham into a show stopper! We combined a nice, dry riesling with sweet peach preserves in a delightful reduction that perfectly compliments the salty and savory ham. The glaze only takes a few minutes to whip up, which means less time in the kitchen and more time spent with family. We make this easy, springtime dish every Easter, and we bet you will too! Preheat oven to 400º F and line a roasting pan with aluminum foil. Place ham on roasting rack inside roasting pan and use a sharp knife to score the outer layer of fat, tracing lines with your knife without cutting too deep into the meat. In a large saucepan over medium-high heat, bring wine, thyme and garlic to a boil. Reduce heat to low and let simmer until reduced to 2/3 cup. Remove thyme sprigs and stir in peach preserves, sugar and mustard until smooth. Remove from heat. Brush 1/2 of glaze over ham and bake for 1 hour 30 minutes, continuing to brush with remaining glaze every 30-35 minutes. Tent aluminum foil over the ham and bake until thickest part of meat reaches 140º F.
Remove from oven and let rest 10-15 minutes, then slice and serve hot.